Is this bad for my computer case? 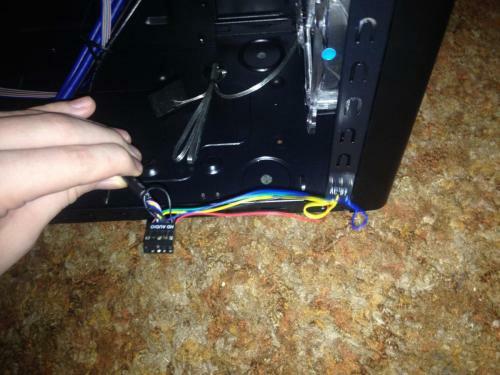 As you can see in this picture: http://imgur.com/tokR5xVhe The audio cables from computer case doesn't look right to me. This is my first build and I don't have the rest of the parts yet, but I'm wondering if this almost tangled looking cable will cause problems later. I have a rose will micro-atx mini tower case. Your link does not work so we can`t see your picture, if the picture is saved as a .jpeg attach it to your next reply. Sorry, I was doing it from my phone and I didn't see an attach a picture option, here you go. The cable/s look fine but depending on the MB that you will use will determine which audio connector you should use, the one that you do not use should be kept tidy using a small cable tie so that it does not interfere with anything. Let us know what MB you have or will have so that we can take a look at the audio options. Any tips that can help with an old ide external dvd burner?